Bronchiolitis is an acute viral inflammation of the lower respiratory tract involving the bronchioles and alveoli. Accumulated thick mucus, exudate, and cellular debris and the mucosal edema from the inflammatory process obstruct the smaller airways (bronchioles). This causes a reduction in expiration, air trapping, and hyperinflation of the alveoli. The obstruction interferes with gas exchange, and in severe cases causes hypoxemia and hypercapnia, which can lead to respiratory acidosis. Children in a debilitated state who experience this disorder with other serious diseases are hospitalized. 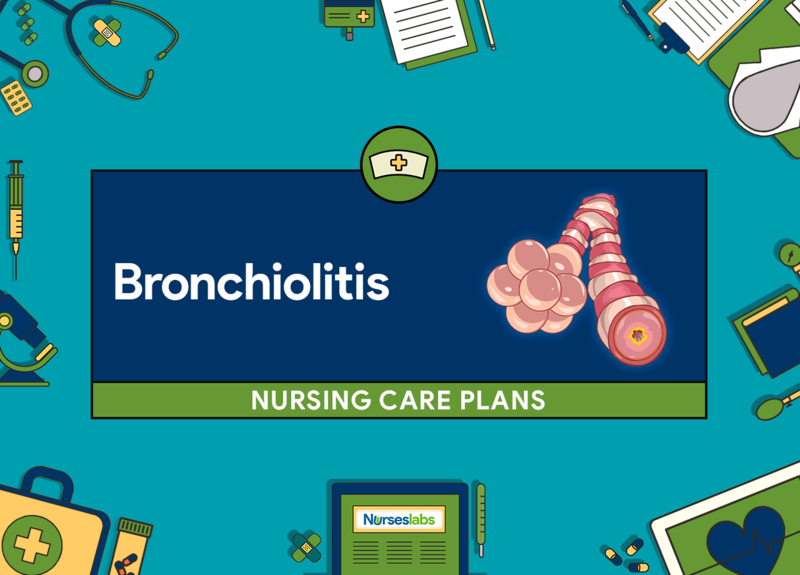 Nursing care planning goals for a child with bronchiolitis include maintenance of effective airway clearance, improved breathing pattern, relief of anxiety and fatigue, increased parental knowledge about the disease condition, and absence of complications. Child will demonstrate effective coughing and clear breath sounds; is free of cyanosis and dyspnea. Assess breath sounds by auscultation. Abnormal breath sounds can be heard as fluid and mucus accumulate. This may indicate airway is obstructed. Assess cough (moist, dry, hacking, paroxysmal, brassy, or croupy): onset, duration, frequency, if it occurs at night, during day, or during activity; mucus production: when produced, amount, color (clear, yellow , green), consistency (thick, tenacious, frothy); ability to expectorate or if swallowing secretions, stuffy nose or nasal drainage. Coughing is a mechanism for clearing secretions. An ineffective cough compromises airway clearance and prevents mucus from being expelled. Respiratory muscle fatigue, severe bronchospasm, or thick and tenacious secretions are possible causes of ineffective cough. Provide for periods of rest by organizing procedures and care and disturbing infant/child as little as possible in acute stages of illness. Prevents unnecessary energy expenditure resulting in fatigue. Elevate head of bed at least 30° for child and hold infant and young child in lap or in an upright position with head on shoulder; older child may sit up and rest head on a pillow on overbed table. Upright position limits abdominal contents from pushing upward and inhibiting lung expansion. This position promotes better lung expansion and improved air exchange. Encourage fluid intake at frequent intervals over 24-h time periods, specify amounts. Fluids help minimize mucosal drying and maximize ciliary action to move secretions. Reposition on sides q 2h; position child in proper body alignment. Prevents accumulation and pooling of secretions. Assist to perform deep breathing and coughing exercises in child when in a relaxed position for postural drainage unless procedures are contraindicated; use incentive spirometer in older child, blowing up balloon, blowing bubbles, blowing a pinwheel or blowing cotton balls across the table in younger child. Vibration loosens and dislodges secretions, and gravity drains the airways and lung segments through Promotes deeper breathing by enlarging tracheobronchial tree and initiating cough reflex to remove secretions. Teach parents and possibly older child (specify) administration of medications via proper route with name and action of each drug: dosage; why given; frequency; time of day or night; side effects to report; how to administer in food—crushed, chewable, by measured dropper, or other recommended form; and method (nose drops, inhaler). Ensures compliance with correct drug dosage and other considerations for administrations for desired results, and what to do if side effects occur. Child will maintain effective breathing pattern, as evidenced by relaxed breathing at normal rate and depth and absence of dyspnea. Assess respiratory status, a minimum of every 2–4 hours or more often as indicated for a decreasing respiratory rate and episodes of apnea. Changes in breathing pattern may occur quickly as the child’s energy reserves are depleted. Assessment and monitoring baseline reveal rate and quality of air exchange. Frequent assessment and monitoring provide objective evidence of changes in the quality of respiratory effort, enabling prompt and effective intervention. Assess configuration of the chest by palpation; auscultate for breath sounds that indicate a movement restriction (absent or diminished, crackles or rhonchi). This is to detect decreased or adventitious breath sounds. Note for changes in the level of consciousness. Restlessness, confusion, and/or irritability can be early indicators of insufficient oxygen to the brain. Assess pulse rate and oxygen saturation using pulse oximetry. Pulse oximetry is a helpful tool to detect alterations in oxygenation initially; but, for CO2 levels, end-tidal CO2 monitoring or arterial blood gases (ABGs) would require being obtained. Monitor arterial blood gases. Monitors oxygenation and ventilation status. Position head of the bed up or place child in position of comfort on parent’s lap, if crying or struggling in crib or bed Position facilitates improved aeration and promotes a decrease in anxiety (especially in toddlers) and energy expenditure. Encourage frequent rest periods and teach patient to pace activity. Extra activity can worsen shortness of breath. Ensure the patient rests between strenuous activities. Assist and demonstrate proper deep breathing exercises. Promotes deep inspiration, which increases oxygenation and prevents atelectasis. Maintain a clear airway by encouraging patient to mobilize own secretions with successful coughing. Facilitates adequate clearance of secretions. Provide humidified oxygen via face mask, hood, or tent. Humidified oxygen loosens secretions and helps maintain oxygenation status and ease respiratory distress. Child will experience decreased anxiety and will appear relaxed. Communicate openly with parents and answer questions calmly and honestly. Promotes a calm and supportive environment. Allow expression of concerns and opportunity to ask questions about the condition and recovery of ill infant/small child. Provides an opportunity to vent feelings, and to secure information needed to reduce anxiety. Encourage parents to remain calm and involved in care and decision-making regarding infant/small child noting any improvement that results. Promotes constant monitoring of infant/small child for improvement or worsening of symptoms. Encourage parents to stay with infant/ small child or allow open visitation and telephoning, have parents assist in care (holding, feeding, diapering) and suggest routines and methods of treatment. Allows parents to care for and support infant/small child; absence and wondering about the condition of infant/small child may increase anxiety. the disease. Provides information to relieve anxiety by informing parents of what to expect. type of therapy, effects of any diagnostic tests to parents. Prevents anxiety by reducing the fear of unknown. are able to listen, give the same explanation other staff and/or physician gave regarding disease process and transmission. Prevents unnecessary anxiety resulting from inaccurate knowledge or beliefs, or inconsistencies in information. Fatigue: An overwhelming, sustained sense of exhaustion and decreased capacity for physical and mental work at usual level. Infant/child will be able to eat, drink, and play quietly. Assess for extreme weakness and fatigue; ability to rest, sleep, and amount; movement in bed. Provides information to determine effects of dyspnea and work of breathing over a period of time, which becomes exhaustive and depletes infant/small child energy reserves and ability to rest, eat, drink. (temperature and humidity). Promotes adequate rest and reduces stimuli in order to decrease risk for fatigue. Disturb infant/small child only when necessary, perform all care at one time instead of spreading over a long period of time. Conserves energy and prevents interruptions in rest. prevent fatigue in infant/small child (holding and/or rocking, feeding in small amounts, playing with the child, offering diversions such as TV, toys). Provides support to infant/small child and conserves energy. Teach parents to pick up an infant/small child if crying longer than 1 to 2 minutes. Prevents fatigue, as prolonged crying is exhaustive. Assist parents to develop a plan to provide feeding, bathing, changing diaper around rest periods. Prevents interruption in rest and sleep. Deficient Knowledge: Absence or deficiency of cognitive information related to specific topic. *Care interventions are related to Respiratory Syncytial Virus. Parents will verbalize understanding of the condition, methods of prevention and treatment of RSV. prevention, transmission, and treatment. Provides a baseline for the type of information needed to prevent infection transmission to the child. direct and indirect contact via the nose and eyes and that hands should be kept away from these areas. Explains that kissing and cuddling infant/small child, and fomites that are on hard, smooth surfaces are sources of contact with the virus. yellow/green sputum. Encourages parents to seek prompt medical attention, as needed. to other family members and need for segregation of infant/small child from others. Explains that virus is easily transmitted, with an incidence as high as half of the family members acquiring viral infections. when caring for infant/small child. Prevents risk of contact with the virus via the eyes. carriers of organisms to the face area. medications prescribed. Improves consistency of medication administration and the recognition of adverse side effects. If hospitalized, adhere to infection control policies for clients with RSV. Protects from exposure to secretions and transmission of the virus to other patients. the constraints of necessary treatments. Teach parents about the prophylactic drugs (if ordered) of RespiGam or Synagis (specify). vaccines. It is very expensive. Promotes parental identity and control; may lessen anxiety and stress. Type and purposes of isolation, including the use of masks, gloves, and/or gowns as applicable. Promotes understanding which may lessen anxiety; prevents accidental exposures to the drug. Teach family members about the appropriate disposal of soiled tissues, and so forth. Prevent the transmission of the disease. limiting the number of visitors and screening them for a recent illness. Prevent transmission of the disease to others; prevent further complications in the child with RSV.